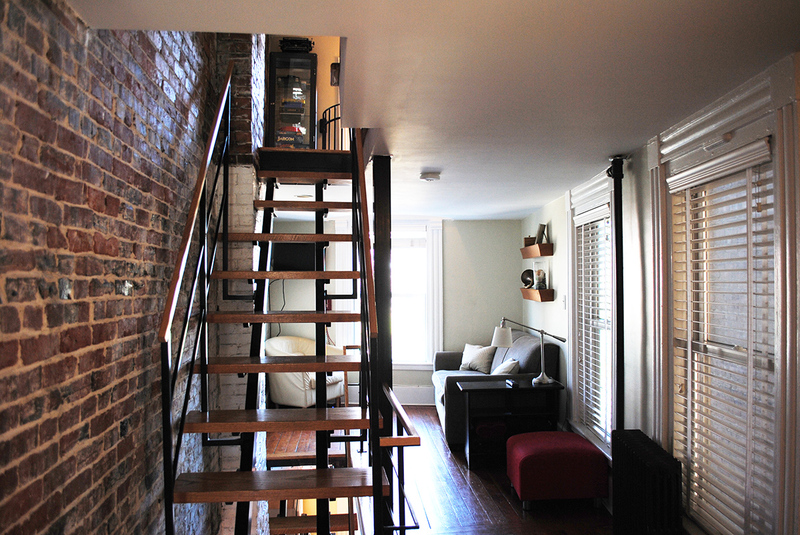 The North End's spite house is as cool as you'd dream it would be. 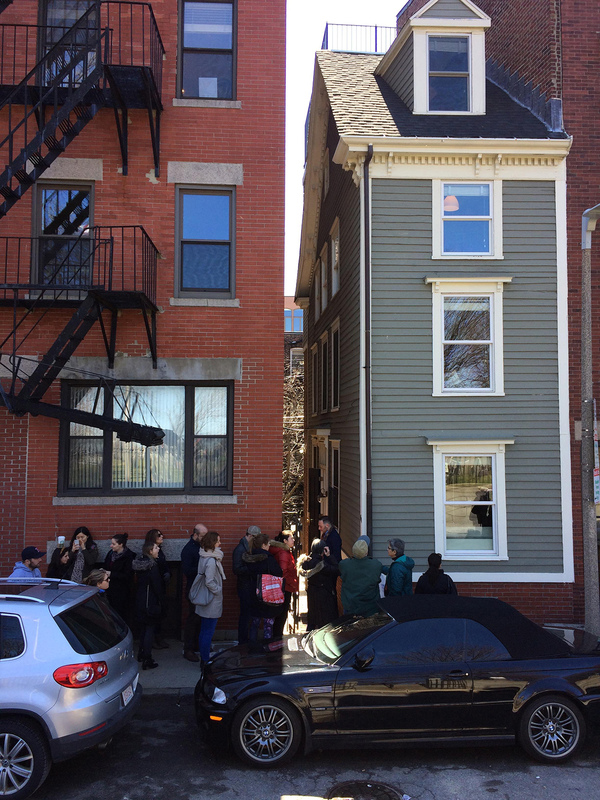 By Madeline Bilis·	 4/3/2017, 5:56 p.m.
A line at least 10 people deep stretched down Hull Street on Sunday—all of them eager to peek inside the Skinny House. Others who happened to be passing by wondered what everyone was waiting for. Once they found out, they hopped in line, too. A group of women descending the steps from Copp’s Hill Burying Ground—across the street from 44 Hull Street—noticed people steadily trickling into the alley beside the house. “I think they turned it into a museum,” said one woman, before the group turned to head toward the Old North Church. The Skinny House, in fact, has not been turned into a museum. Although there was no sign out front, Cabot & Company realtor Eric Shabshelowitz hosted an hour-long open house on Sunday afternoon, letting prospective buyers assess the home’s apparent slenderness. The 10-foot-wide house hit the market for $895,000 on Friday. Upon further inspection, it seemed many of the people in line were simply interested in seeing the inside of Boston’s famed spite house, and not so willing to shell out almost $900,000. I was also in the curiosity camp on Sunday, and reveled in the spring-like temperatures before venturing inside the house, camera in hand. After I inched down a narrow alley, the house’s main door opened just enough for me to enter. Immediately, the place felt more spacious than anticipated. It was also noisy—there were about six or seven people touring the house at the time (the realtors let in a maximum of 12 to 15) and every footstep was audible from the first floor. 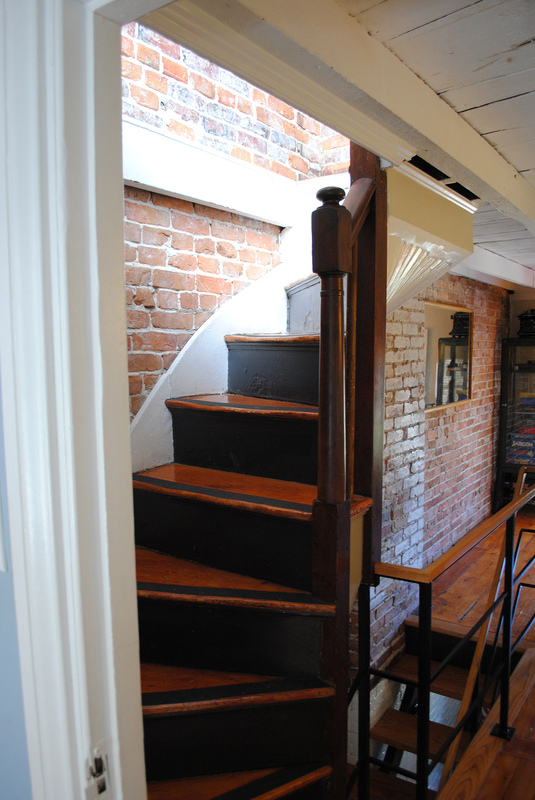 That’s because the place is somewhat open-concept; freestanding metal stairs offer glimpses of floors above and below. Shabshelowitz warned me taking photos inside the Skinny House would be tough, and it was. The place simply isn’t wide enough to capture a photo of a whole room. (As you might imagine, the place lends itself better to vertical shots.) While photos don’t do the place justice, I can confirm it is indeed skinny—and just as cool as you’d dream it would be. Up one more floor is a study with a desk and a bookshelf—the ceilings are low enough to touch just by reaching up—and a few steps away is one bedroom with built-in bunk beds. The stairs to the top floor are the most narrow of all. They’re also curved. 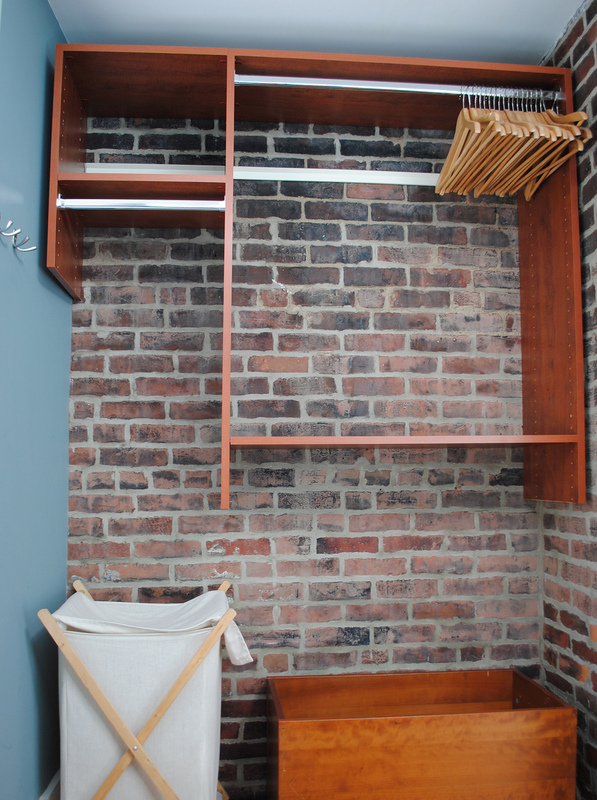 A master bedroom with a den takes up the fourth floor, which includes an impressive built-in closet space. Above, sun streamed in from the open hatch to the roof deck. 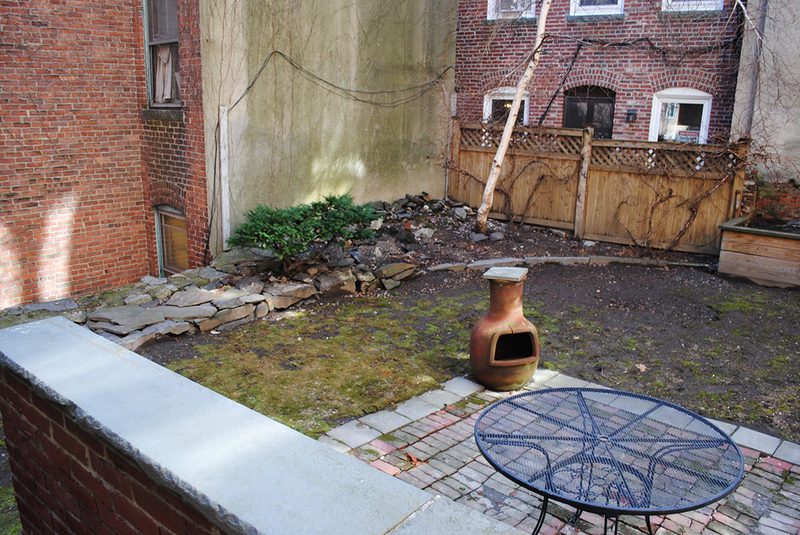 I thought the roof deck would be the best outdoor hangout space, with its gorgeous views of the harbor and the skyline, but the spacious backyard is the real surprise of the place. Though the ground-level sliver of the property’s total 0.03 acres doesn’t boast sweeping panoramas, the backyard offers a patio, a grassy patch, and access to a basement storage area. It also technically takes up more space than the foundation of the house. From the inside, the 1,166-square-foot abode doesn’t feel like it was built in 1884 (or like it was built out of spite). 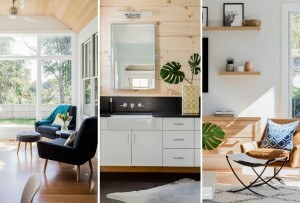 Instead, the house, which is outfitted with a Nest thermostat and an abundance of modern storage solutions, feels more like a renovated apartment that’s been chopped up into four perfectly stacked pieces. While it may not be the best option for loud roommates or people with bad knees, the more than 50 groups who toured the home on Sunday were certainly charmed by the place. 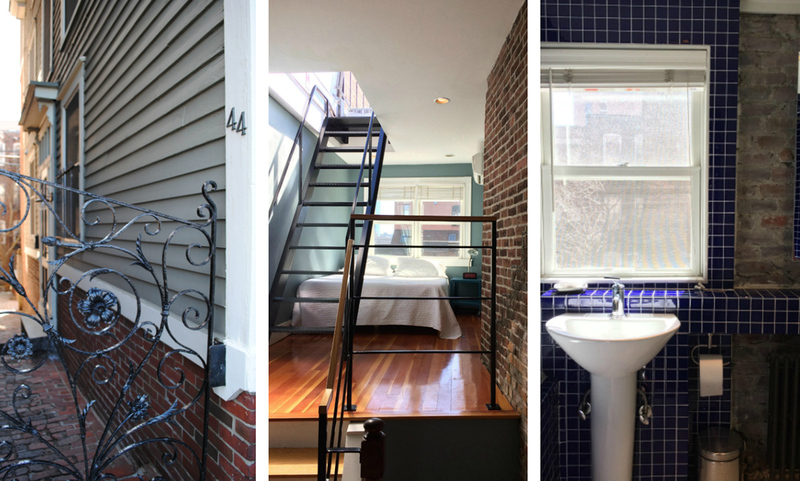 By all standards, the Skinny House is the most interesting house in Boston.